Last April, the British department store BHS collapsed – taking with it more than 11,000 jobs and leaving behind a £571 million pension deficit. Now, former BHS owner and billionaire Philip Green has agreed to pay £363 million of his own money to plug the massive hole in BHS’s pension scheme. 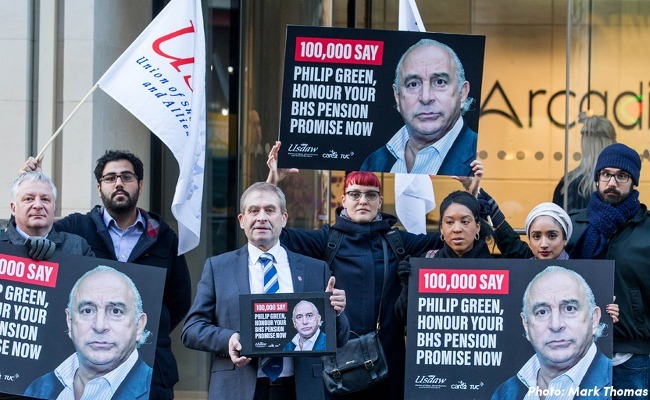 This settlement comes after months of campaigning from the Usdaw shop workers union, a lengthy parliamentary inquiry, and a huge Care2 petition that involved over 100,000 Care2 members coming together to tell Philip Green to live up to his promise to sort the pension scheme. Our public pressure made it hard for him to dodge his responsibilities to BHS pensioners. He was embarrassed to put his hands in his pocket and offer £100 million more than his initial offer. John Wood from the Trades Union Congress expressed his gratitude to Care2 and all those people who fought to make this campaign a success. “A big thanks to all the Care2 members who came together online to back the BHS workers’ campaign. All the public pressure over this case helped add up to bring Philip Green back to the table with a significantly better offer,” he said. All this is a huge vindication of our efforts and shows that when the people are united, they absolutely can make a difference. Even billionaires are susceptible to public pressure. Hopefully, this campaign will send a message to all employers that it is not acceptable to shirk away from the responsibilities to workers, current or retired. Thanks to everyone who helped this campaign become a win!